TRUCKING COMPANIES – Our kit provides a “Less-Than-Truckload” and “Less-Than-Pallet™ Load” shipping option for trucking companies to attract clients who ship smaller freight amounts. THIRD-PARTY COMPANIES – Our kit provides a value-add service opportunity, unique differentiator, and lower-cost option for those companies who provide packaging, fulfillment, and shipping services. RESELLERS – Our kit meets the needs of a variety of end users, providing shipping and packaging resellers with a high-demand, environmentally-friendly product that offers an additional revenue source. GENERAL BUSINESSES – Our kit meets the needs of businesses looking to transport products quickly, easily, and cost-effectively, independent of load size or pallet quantity. PERFORMANCE – The Green Ox® (and box!) is strong, durable, and can safely carry most product loads. STORAGE / ASSEMBLY – Don’t have the room to store wood pallets? The Green Ox® (and box!) kit is only 38″ x 38.25″ x 6.25″ when packaged, requiring minimal storage space and providing J-I-T availability. It’s also lightweight (app. 30.5 pounds) and easy-to-assemble (takes one person ~ three minutes to put together). 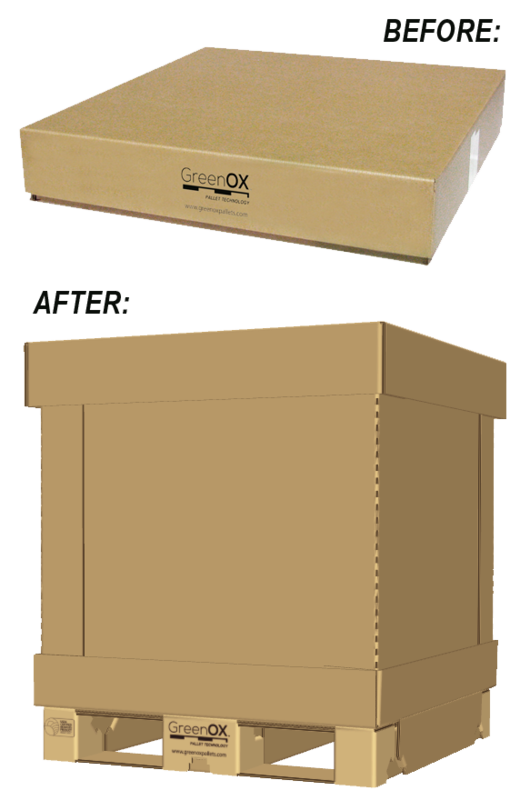 SHIPPING – Because the Green Ox® (and box!) weighs considerably less than a wood pallet, users can realize significant savings on fuel and transportation costs. Users can also ship smaller quantities (“Less Than Pallet™ Load”) affordably and conveniently. Once the box is loaded, it’s ready to be shipped. PRODUCT & WORKER SAFETY – The Green Ox® (and box!) weighs considerably less than a wood pallet and is easy to handle, free of protruding nails and splinters, and has smooth surfaces—protecting both your product and your people. SUSTAINABILITY – The Green Ox® (and box!) is made from corrugated cardboard that is 100% recyclable, providing post-use recycling revenue. CUSTOM SIZES – Our patented technology allows for the design of custom kits that meet the specific needs of individual companies, product lines, and client needs. Companies benefit from design flexibility, cost savings, and quick turnaround when working with us to develop a custom kit. We invite you to experience first-hand how the Green Ox® (and box!) can provide your business with multiple revenue and/or cost savings opportunities while also providing your clients with a unique packaging and shipping product. Contact us to learn more, test our product, and identify the specific benefits we can offer you. Pictured Above: The Green Ox® (and box!) 36x36 Kit (in the box and after assembly).